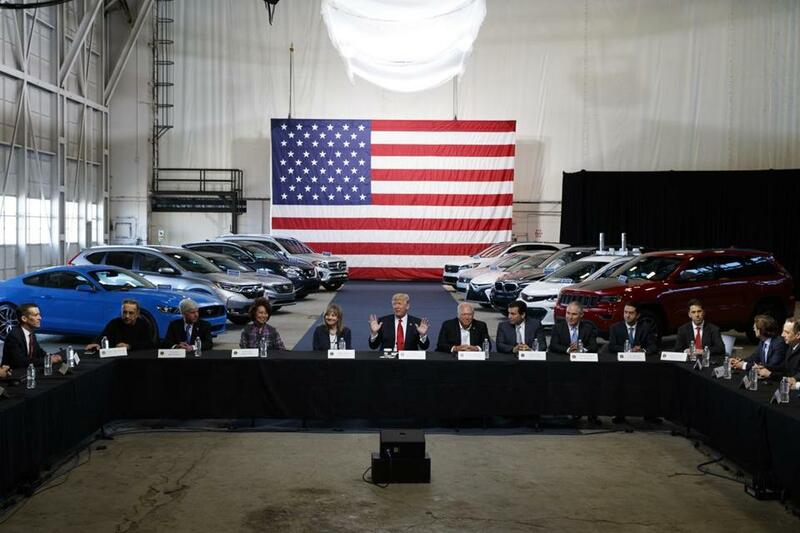 President Donald Trump hosted a round-table discussion at the American Center of Mobility in Ypsilanti, Mich., on Wednesday as he prepared to move against Obama-era automobile fuel consumption rules. YPSILANTI, Mich. — President Trump announced Wednesday that the administration will reexamine federal requirements governing the fuel efficiency of cars and trucks, moving forcefully against Obama-era environmental regulations that Trump says are stifling economic growth. Trump revealed his plans during a speech at an automotive testing center near Detroit after discussing the issue during a round-table meeting at the American Center for Mobility with auto company executives and workers. ‘‘This is going to be a new era for American jobs and job creation,’’ Trump said at the meeting. The EPA under Obama had promulgated a rule for cars and trucks requiring a fleetwide average of 36 miles per gallon in real-world driving by 2025. ‘‘My administration will work tirelessly to eliminate the industry-killing regulations, to lower the job-crushing taxes, and to ensure a level playing field for all American companies and workers,’’ Trump said at the center, which produced B-24 bombers during World War II and is being converted into an automotive testing and product development facility. ‘‘If they succeed we’ll pay more at the pump, depend more on oil from bad countries, drive up the trade deficit, and pollute our kids’ atmosphere,’’ said Dan Becker, director of the Safe Climate Campaign. Senator Edward Markey, Democrat of Massachusetts, said withdrawing the fuel efficiency standards will force families to pay more at the pump. He said rolling back the regulations would also cause uncertainty for the auto industry and threaten economic and employment gains automakers have made in recent years. Markey is a member of the Senate Environment and Public Works Committee. The Alliance of Automobile Manufacturers last month urged EPA administrator Scott Pruitt to relax the standards, saying they will drive up car costs, price customers out of the market, and depress the industry. Obama’s EPA had argued the costs to consumers were mitigated by gas savings and that the rules would decrease greenhouse gas emissions that contribute to global warming. Trump told the auto executives that while he’s attuned to concerns about the environment, he doesn’t want to stifle jobs. Trump campaigned on eliminating ‘‘job killing’’ regulations, and the administration is expected to take additional steps in the coming days to roll back environmental regulations. ‘‘Mileage standards save consumers money at the gas pump, make Americans less dependent on oil, reduce carbon pollution, and advance innovation,’’ she said.